JOHN DEERE TRACTOR MODEL 430 NEW EXHAUST MANIFOLD. We have over thirty years of experience in John Deere Tractors. We offer almost a complete line of parts for Models H, GP, Unstyled B, M, MT, and many other two cylinder tractors. We stand behind the parts we sell and if we make any error, we correct it. This is an honest family business that has worked hard to earn the respect of our customers and peers! WE OFFER A LARGE SELECTION OF OTHER ITEMS ALSO JOHN DEERE GAUGES.. IF YOU DON'T SEE AN ITEM LISTED... 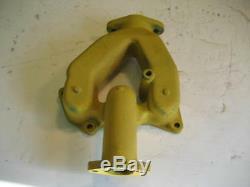 The item "JOHN DEERE TRACTOR MODEL 430 NEW REPRO EXHAUST MANIFOLD T10369T" is in sale since Tuesday, June 25, 2013. This item is in the category "Business & Industrial\Heavy Equipment Parts & Accs\Antique & Vintage Equip Parts". The seller is "davecooktractors" and is located in Washburn, Wisconsin.